With all of the options out there for Cloud computing, IT decision makers are faced with a difficult choice. Should they keep their Oracle e-Business Suite ERP system “on premise” or should they move it to “the Cloud”? If it is to a Cloud, which one? Private, Public or Hybrid? With options from Oracle, Amazon, Microsoft and others, it is a confusing time. A Private Cloud is often the best / only solution for those customers that need to be in absolute control of where their data is, and which security measures and tools protect it. This is often the default choice for large financial institutions and Central Government agencies. A Public Cloud such as those from Amazon and Microsoft comes with many benefits such as scalability, cost savings and flexibility. These types of solution are often perfect for hosting less sensitive data and public-facing applications. Finally, the Hybrid Cloud option is used by many organisations so that they can host their sensitive data on a Private Cloud whilst taking advantage of Amazon or Microsoft Clouds for their “everyday” applications. RightScale, in their 2017 “State of the Cloud” report, identified that in 2016, Amazon had 57% of the Public Cloud market, with Microsoft on 20% and Oracle on just 4%. The same report predicts that Amazon will retain this share in 2017, Microsoft will increase their share to 34% and Oracle will lose ground, with just 3% of the market. Migrating to the Cloud: How long does it take? If you think about the process, it is not difficult. You are simply ‘lifting and shifting’ a fully configured and working system onto new hardware. Yes, you need to run it as a project and Yes, you need to test everything to make sure it works. However, realistically the main things you will be changing are where interfaces pick up files from and where they deliver them to. There will be other small changes but it is not complex. This all assumes of course that you are moving from “on premise” hardware, hosted hardware or another Cloud platform to the new Cloud. If you combine this with say an upgrade, then the timeframe will be decided by the upgrade rather than the “lift and shift”. The answer is that it typically takes 3 months to move to the Cloud, which usually includes a test iteration and then the live migration itself. Did you know that you could move your current Oracle E-Business Suite to the Cloud AND cut your software maintenance bills by at least 50%? Support Revolution can move your current Oracle E-Business Suite to the Cloud and manage it for you, enabling you to take advantage of all of the benefits without losing the massive investment you have made in your current system. Support Revolution are the only organisation globally that can move your Oracle e-Business Suite system to the Cloud, (Amazon, Microsoft, Oracle, Google etc.) and then help you to save over 50% on your vendor maintenance charges, avoid costly upgrades and stay on Premium Support with our team for as long as you wish. 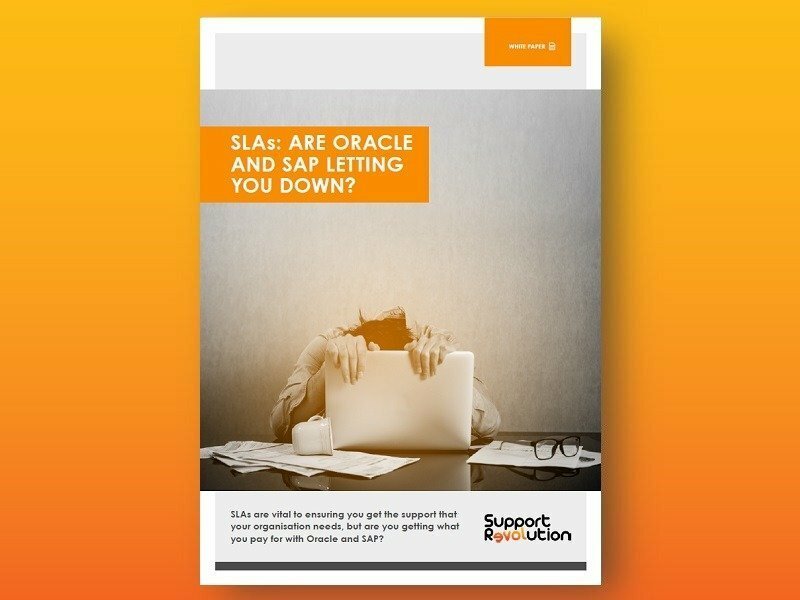 Via our sister company (an Oracle and SAP partner), we can also help you to source any additional licenses that you might need so that you can be compliant and purchase any additional products that are on your wish list.